The village of Killearn, Scotland. All Killearn Archive. The Killearn Community Futures Company was formed in 2003 as a mechanism for advancing the Killearn Community Action plan. The company is intended to be an umbrella organisation for more focussed "Project Groups" with specific areas of responsibility within the community. It was envisaged that some groups would be dissolved when their work was complete and others would be formed as new projects were established. Though Killearn is the largest village in the area it had no heritage group, though other smaller local communities have groups under various names. A number of residents came together in 2006 to start an additional Project Group, now named the "All Killearn Archive" ( AKA ) to safeguard the heritage of the village and parish. Many enquires were being received, mainly through the internet, regarding family history or the history of the parish. This identified a need to draw together relevant historical documents to facilitate research. Residents were known to have artifacts, records or photographs from Killearn's past which it would be of value to collect in one place and preserve (or copy, photograph and catalogue). There was, and remains, a real risk that the value of historic material would not be realised and many items would end up in the "black bag" heading for the landfill site. People's memories of life in the area needed to be collected. Life today is tomorrow's history. Recording current events will be of real interest to people in the future. People would like to learn more about the history of the area and understand why modern Killearn is the way it is. 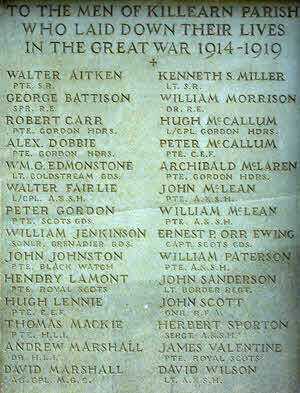 Killearn War Memorial, dedicated in 1924, stands close to the church. Each Remembrance Sunday a service is held at the Memorial and the names of the dead from World War 1 and World War 2 are read out. To many of today's residents these are simply names and few have any knowledge of the real people they represent. A project is now under way to find the stories behind these names, including obtaining pictures of each person where possible. The aim is to make this information available to all and so to enhance the memory of those who paid the ultimate price for their community. David Wilson (Lieutenant, Argyll and Sutherland Highlanders). Eric N. McCuig (Flight Sergeant, Royal Air Force). A further name from Killearn, not on our War Memorial but remembered on the Naval War Memorial, Plymouth, is Robert Harter Roxburgh a Lieutenant in the Royal Naval Volunteer Reserve. Do you have connections with any of these people? If so have you any information which could be added to that already collected e.g. photographs, letters, family stories, service records or even artifacts? The Archive Group would like to copy, photograph or record any items linked to the names. If you have information please contact us by e-mail at mail@killearn.org.uk. "Drop in Days" were held in April 2007, March 2008 and March 2009 in the Village Hall. Everyone was invited to come along during the day to discuss the work being undertaken. A number of long term residents of Killearn received personal invitations. The 2009 day had as a theme the young people's uniformed organisations ( Scouts, Guides, Brownies, BB etc. ). Many of the village's young and not-so-young people found browsing the photographs and memorabilia on display brought back fond memories. On each occasion visitors started to appear as soon as the doors opened and many were still there hours later! Members were busy interviewing visitors and copying photographs they brought along. So much was received that there was insufficient time to record all the information. We were grateful to those who allowed their photographs and written material to be retained for copying later. We would also like to thank those who donated material to the Archive. If you have items of historical interest which are no longer required they would be most welcome to the Archive. Material can be passed on to any of the Archive members for safe storage and cataloging. In addition we would like to copy any photographs, pictures, maps or written historical material to add to the Archive. Members can arrange home visits to record material so that it does not have to leave the owner's presence. A major difficulty faced by the group was the absence of storage and display facilities. The opening of the refurbished Killearn Village Hall in June 2013 has provided these facilities. AKA now has 6 display cabinets incorporating storage cupboards located in the entrance area and the Coffee Shop in the Hall. The cabinets now have historical material on display which is rotated at intervals. In addition AKA has a dedicated computer, located between the Coffee Shop and the Main Hall which will be used to display material using a Web Browser interface. At present the material available on the computer is limited. However, over time more will be added with the aim of having all information held by the group available to be studied in this way.